In my last post I spoke a bit about Delta Green. 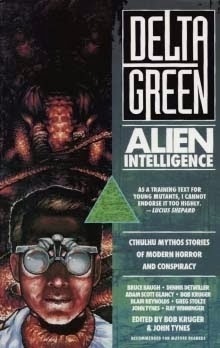 After posting I realized that my familiarity with Delta Green is solely through RPG supplements and I was very unfamiliar with the Delta Green. To be honest, I have a tendency to avoid most "gaming fiction" - I read and enjoyed Dragonlance and Drizzt once upon a time but generally speaking I tend not to enjoy it. 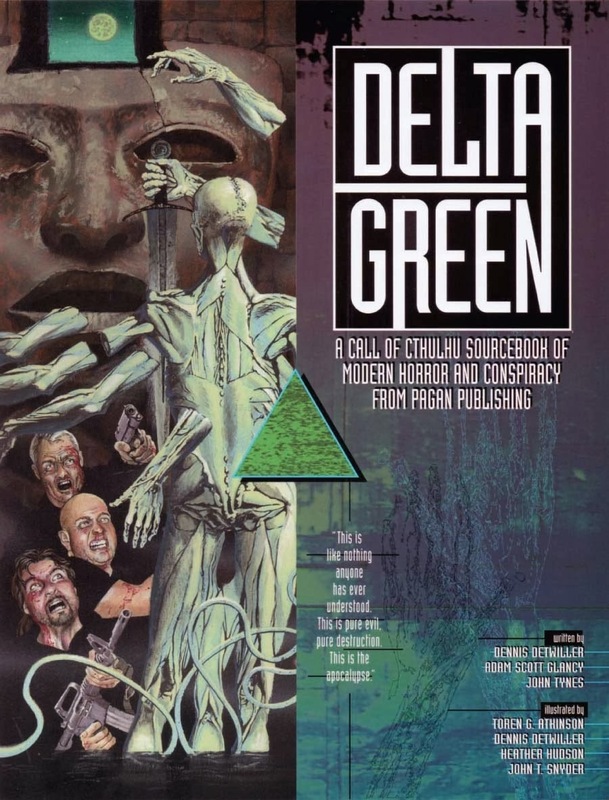 However, I was curious as to the Delta Green fiction so I asked around on the Call of Cthulhu RPG Google+ Community.The people there spoke very highly of the Delta Green fiction, even those who, like me, generally don't read RPG fiction. With that in mind I've obtained some ebooks of what seemed to be available and did some searching online to compile a list of what seems to be available in chronological order. After I finish the first anthology I'll post a review. However in the meantime I thought it might be worthwhile to share what I've been able to find. 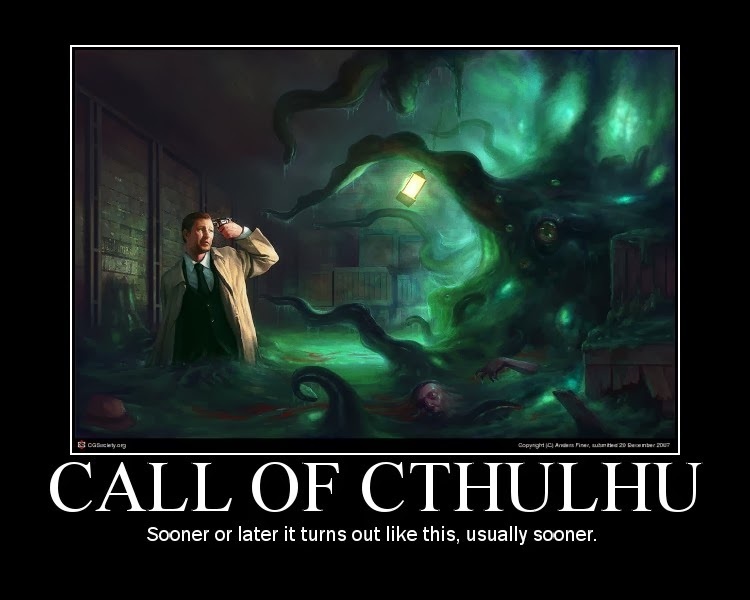 HP Lovecraft's Cthulhu Mythos have had an influence on various forms of entertainment. Many episodes of Doctor Who and Star Trek have had a Lovecraftian feel to them. The early Tom Baker episodes of Doctor Who with stories like Pyramids of Mars, Horror of Fang Rock, and Talons of Weng-Chiang have many elements to be found in the Cthulhu Mythos, like ancient aliens, god-like beings visiting the Earth, etc. Star Trek had references to the Old Ones placed by Robert Bloch in What Are Little Girls Made Of and many episodes dealt with the remnants of previous interstellar empires - the Iconians, known as "Demons of Air and Darkness" come especially to mind. And looking at the Mind Flayers of Dungeons and Dragons one cannot help but find influences from Lovecraft. What I've found rather interesting is those settings which go beyond mere influence from the Cthulhu Mythos but embrace their cosmos in its entirety yet put their own unique perspective on them. The Call of Cthulhu RPG has a reputation for extreme mortality. If you don't die you're pretty much doomed to go insane. The rules certainly allow for this to happen. Even without adding the supernatural your character is rather fragile. He or she has about 12 hit points. Almost any firearm can kill an investigator with a single hit (sometimes requiring a critical). As of the 6th edition you can only dodge once per round so if your foes gang up on you you're pretty much doomed. Add to it supernatural beings and you become aware of just how fragile your character is. And then you've got the danger of going insane. It doesn't take much to drive an investigator at least temporarily insane.